Microgamings Kings of Cash is presented with 5 reels and 15 pay lines and the Kings referred to are the playing cards Hearts Clubs Diamonds and Spades. Looking at the video slot you will soon realise that the game is not depicted as serious however there is some serious cash to be won! There are Wilds and Scatters with the Wild being able to substitute all other symbols except the Scatter. Other symbols include treasure chests, coats of arms, crowns and a kings’ throne. The Scatter is the Treasure Chest and trigger at least 3 of these and you are rewarded with 10 Free Spins, you will get 15 free spins if you trigger 4 treasure chests and if you trigger 5 you are rewarded with 25 free spins. It is worth noting that winning on a free spin will give you a multiplier of at least x2 and depending on how many scatters you triggered your multiplier can go up to x10 of your total bet. Although betting starts at $0.01 there is plenty of potential for a bigger wager remembering the amount of lines available. 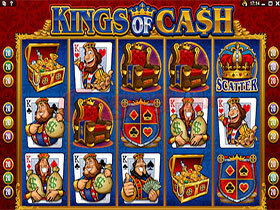 Kings of Cash is a straightforward and enjoyable game and there is a lot of cash to be won with some excellent multipliers.